On Monday, hundreds of Harvard University students walked out of class for the second time in seven days, demanding that the school settle with the 750 dining hall workers who went on strike earlier this month after negotiations failed over health care and annual income. The strike is now entering its third week. Harvard University Dining Services workers have picketed outside the university’s dining halls daily, the Boston Globe reports, while Senator Elizabeth Warren and actor Ben Stiller have made appearances on the picket lines. Some of the dining halls have been closed, and some are still open—staffed by managers, non-union workers, and temporary employees. Organizers and activists characterized Monday’s walkout as even larger than last week’s. In a text message, Pappas said she estimated there were “1,000s” of people demonstrating, and dozens of students and workers gathered in the lobby of the administrative building where negotiations have been held. “Students are sitting down while we meeting with administers [sic. ],” Pappas wrote. Students commence a sit-in at the Harvard University building where union negotiations are being held. Photo by Anabela Pappas. 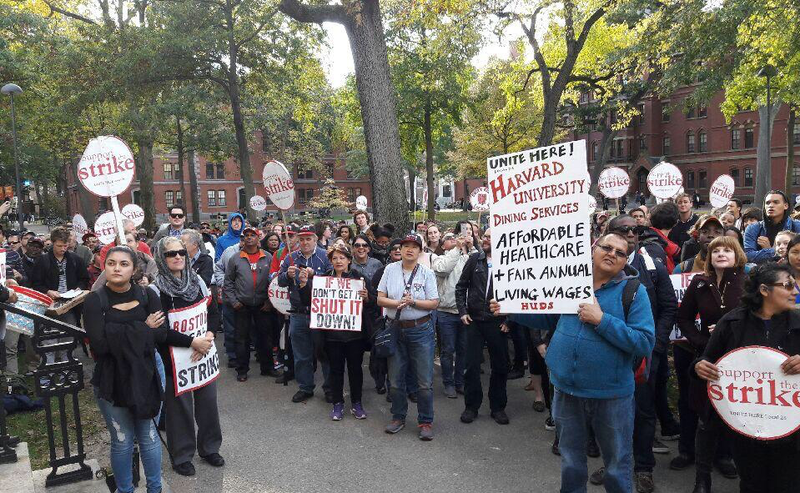 According to UNITE HERE Local 26, the union that represents the dining staff, half of Harvard’s dining services workers earn less than $35,000 a year, despite the university maintaining a $62 million operating surplus at the end of the 2015 fiscal year. The dining hall workers have been negotiating for an annual income of at least $35,000 and against a new health plan. In 2002, the university agreed to pay low-income workers a living wage, largely as a result of pressure from the union. However, according to Harvard Magazine, because dining-hall employees don’t work year-round, their annual incomes are still less than what is necessary to support a family in the Boston area—despite being paid more than their peers at other local cafeterias. Police arrested a small group of women for blocking traffic in Harvard Square on Friday, including 55-year-old Dora Gladys Romero, who had been worried about the possible consequences of going on strike. “You don’t know what we’re walking into,” she told Public Radio International. Both she and Any Montoya, 32, say they had never done anything like that before. Montoya says she went to a few protests during her college years back in Colombia, where she grew up. But those demonstrations turned violent and she didn’t want to take the risk. She says she joined the group of women to block traffic on Friday to send a message to the university, to show that striking dining hall workers were not powerless. The charges against Romero, Montoya and seven other workers were dropped. But they will still have arrest records.